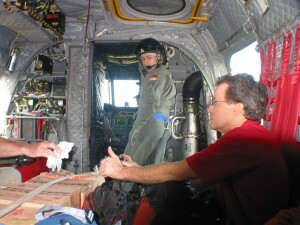 A very special thanks to Bill Coltart, Paramedic (Project Leader) Glen Polson, Paramedic David Deines, Paramedic, (Logistics) Dr. David Ratcliffe, ER Physician, Dr. Daryl Leski, ER Physician, Dr. Kirk Sundby, Ortho Surgeon, for their hard work, dedication and devotion on this difficult mission. 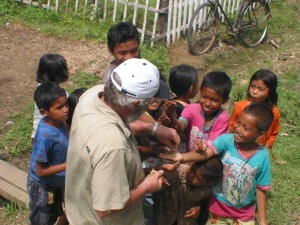 Photos courtesy of CMAT staff. 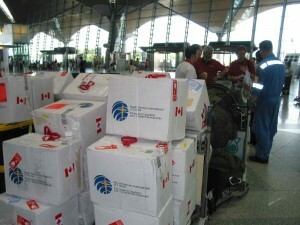 Medications purchased from HPI Canada with CMAT donation dollars wait in Medan to be loaded. 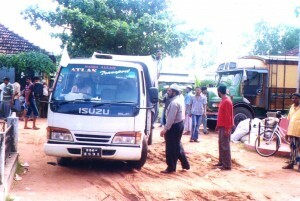 (January, 2005). Happy Indonesian boys display Canadian flag stickers they received from our team. 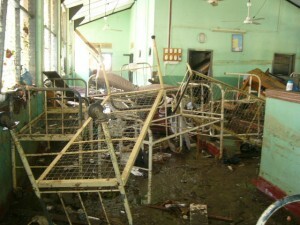 (January, 2005). Tsunami devastation – Meuloboh residents struggle to cope with the changed landscape to try to assume a normal lifestyle. (January, 2005). Tsunami devastation – Police vehicle badly damaged sits in Meuloboh street (January, 2005). 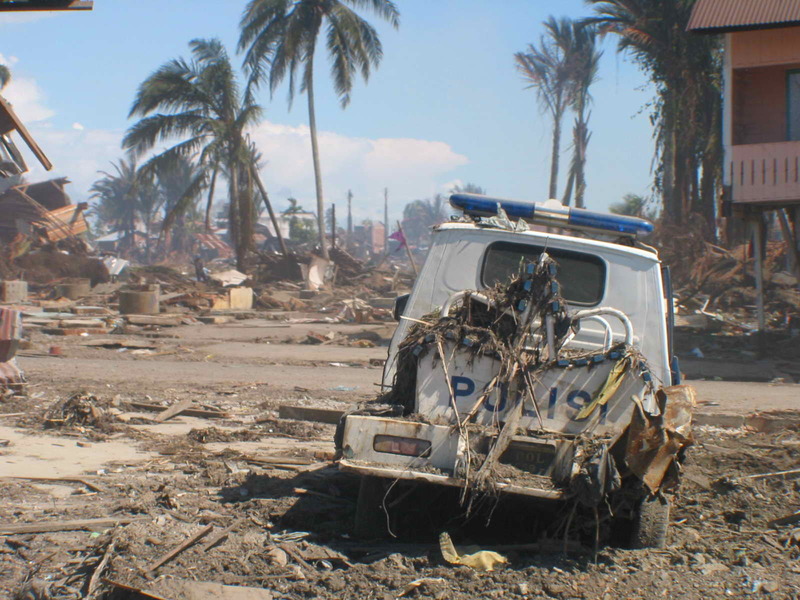 January 7, 2005 – A very special thanks to Bill Coltart, Paramedic (Team Leader) Glen Polson, Paramedic David Deines, Paramedic, (Logistics) Dr. David Ratcliffe, ER Physician, Dr. Daryl Leski, ER Physician, Dr. Kirk Sundby, Orthopedic Surgeon for their hard work, dedication and devotion on this difficult mission. 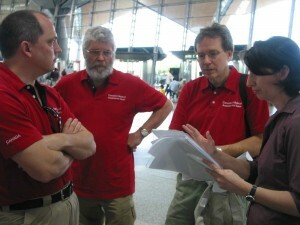 Photos courtesy of CMAT staff. 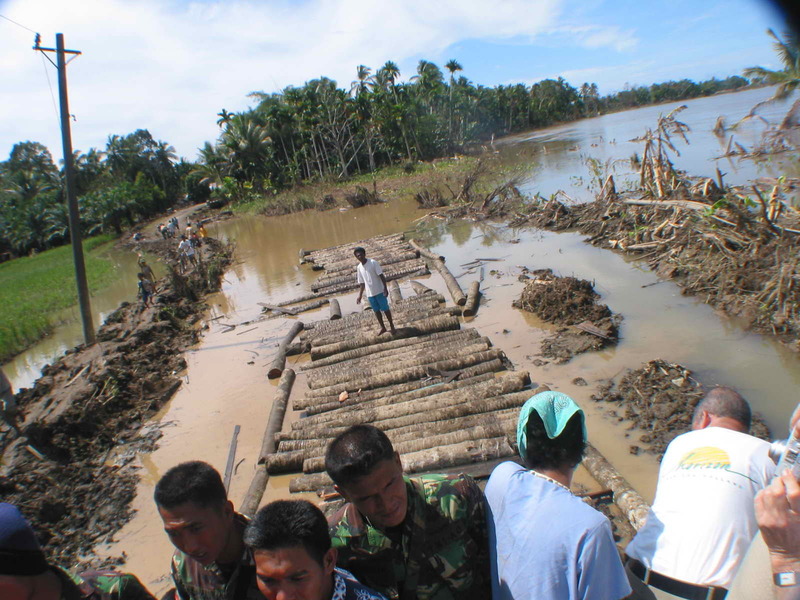 Tsunami devastation – Resilient Indonesian men in Meuloboh begin building a bridge into their devastated community. (January, 2005). 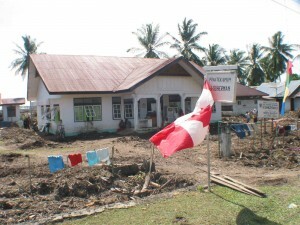 Generous Donations pouring in for tsunami relief. J&R Hall has generously donated ground transportation for donated goods, and Flexia Corporation has donated roofing underlay. January 4, 2005: CMAT announced today that J&R Hall Transport will be working with CMAT to offer on the ground logistics and transportation for in-kind donations to warehouses in the Toronto, Canada area at no cost. 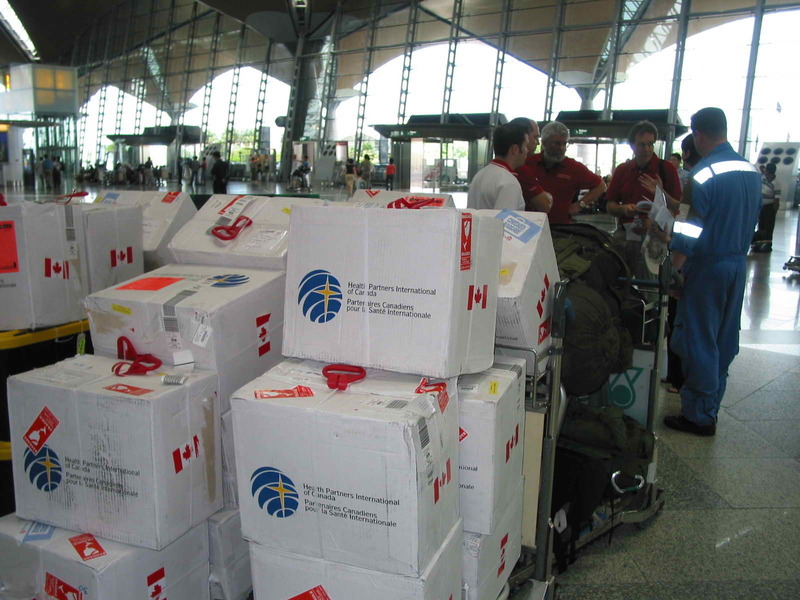 January 3, 2005: CMAT announced today that Skylink Aviation of Toronto shipped a skid of medical supplies to Kuala Lumpur ahead of the CMAT Medical team’s departure for Indonesia. CMAT is grateful for their generous assistance. 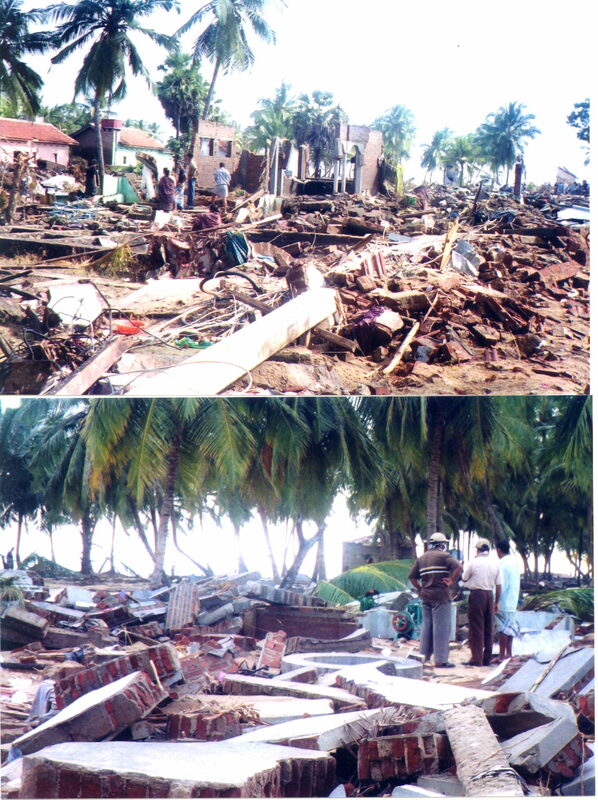 January 2, 2005 – Photos of Tsunami emergency relief projects, Sri Lanka. 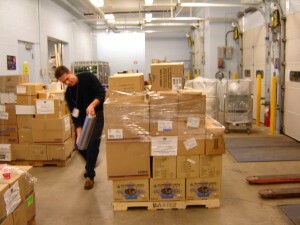 Ken Gilroy, Manager of Brantford General Hospital Stores, Brantford, Canada, helps shrink wrap a skid of medical supplies which will be shipped by air cargo to Sri Lanka by the weekend (December 30, 2004). 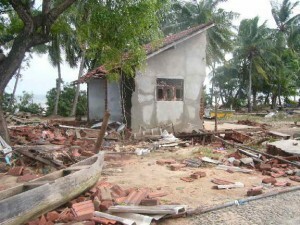 A destroyed home in Kinniya, Sri Lanka (Photo courtesy of Imthiyas Jawfar, December 30, 2004). December 30, 2004 – CMAT consulted today with its medical team and CMAT Chairman to reassess its emergency relief efforts in Asia. 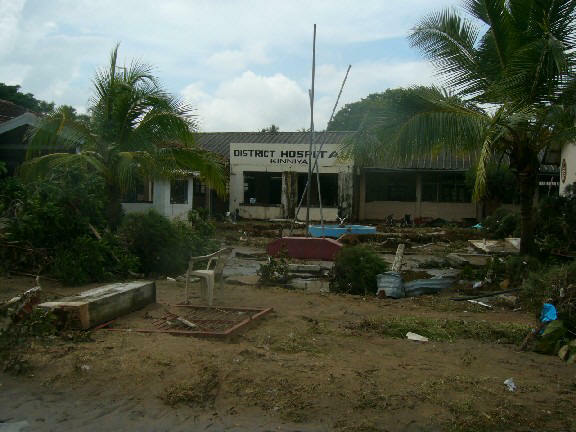 Relief efforts have so far focused on Sri Lanka which sustained major devastation and over 28,000 deaths, and CMAT has air shipped three skids of medical supplies to its partner in the region. 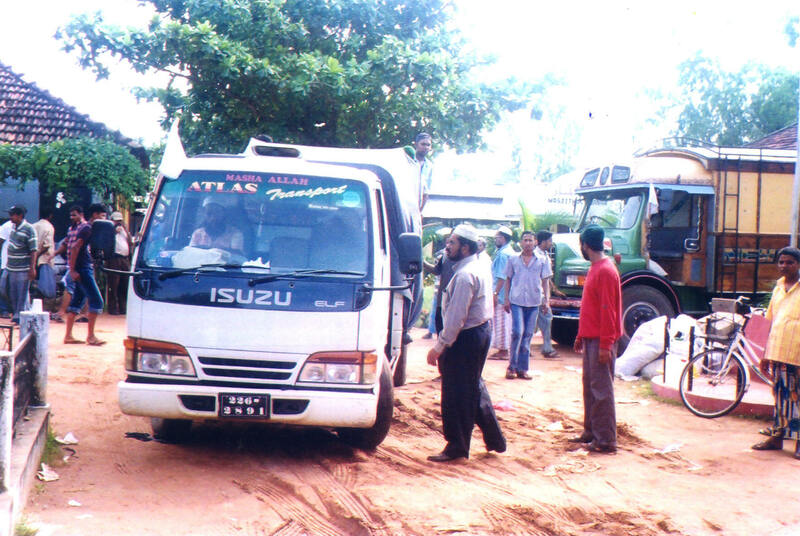 December 28, 2004: CMAT reported today that it is establishing networks with relief agencies on the ground in Sri Lanka and is continuing to prepare a relief shipment. CMAT is working to have the relief shipment consisting of medical supplies, medications, canned food, and infant formula included on a Canadian military cargo flight to the area sometime within the coming week – CMAT is currently working out logistical details. 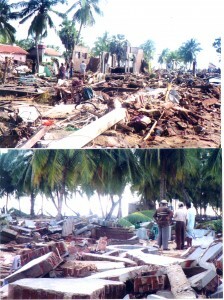 December 27, 2004: CMAT reported today that it is launching emergency relief operations for Sri Lanka, the hardest hit country in the recent 8.9 magnitude quake that rocked 9 Asian countries on December 26. The death toll is 23,000 and climbing.